Gremio - Cruzeiro predictions for Brazil Serie A match at Arena do Gremio, Porto Alegre. The guests are on fire and can steal points. Read on for live streaming info and our free predictions. Do you want to watch live streaming of Gremio - Cruzeiro and bet live? Go to bet365 Live Streaming and place winning bets! A big battle at the top will take place in the middle of the week in Porto Alegre! Both clubs are claiming the podium and will reveal the winner today. It will be very interesting clash, considering such results both teams are showing now and how interesting their history of confrontations is. 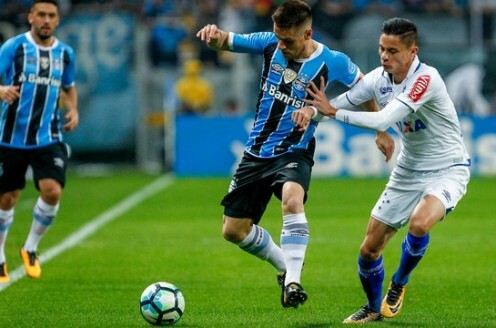 On the one hand, Gremio have always played successfully at home against visitors from Belo Horizonte, having managed to win in eight of the last nine games and losing only once in the last 13 years. On the other hand, Cruzeiro looks much better now and ready to interrupt a series of misfires at Arena do Gremio. The Foxes have lost only once in 11 rounds, having managed to win five of their last seven games – these guys are unstoppable! Cruzeiro looked poor on the road all season, but this autumn everything changed – they managed to take nine points in last four away games, having scored nine goals! Cruzeiro are the hottest team league at the moment and this fact guarantees trouble for the hosts. If Cruzeiro are in good form, then Gremio does not look their best now. The hosts managed to win only two games from the last seven, yes, perhaps Immortal Tricolor are still look convincing in the defence, but nothing is working out in the attack as they have scored in only two of their last seven rounds. Such record seems shameful even for an outsider! Nevertheless, today the hosts probably will score at least one goal, because they are still dangerous at home venue, however, the guests look stronger and their forwards are on fire, so this game should be entertaining.